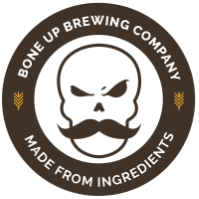 Stats: El Pulpo - Bone Up Brewing Co. Cheese Pairing: Bonne Bouche or aged Valençay. Music Pairing (Jared's Choice): "Last Caress" by Misfits Meet the Nutley Brass or "Cemetery Gates" by Steve 'n' Seagulls. Best Occasion to Drink: There's nothing better than a cold beer on a hot Christmas morning. Brewer's Notes: I'm not big on brewing beers with a bunch of weird crap in them. You might not think so if you glance through our beer list - one of our flagships is meant to taste like pie, and now we've got this chocolate orange beer - that sounds exactly like the kind of gimmicky crap designed to lure in people who "don't drink beer." But what it comes down to is that we'll make exceptions to our own rule for special occasions, and in this case the occasion was Christmas. I love the hell out of Christmas, and one of my favorite things to do every year is brew something new and special for every holiday season (the tradition around here is to set aside a half dozen or so bottles from every year and then share a bunch of previous years' Christmas beers all in a row, culminating with the newest one). I feel like a big occasion merits a big beer, and I'm partial to stouts anyway, so I usually use an imperial stout as my starting point (they also tend to age really well, which is a plus). And I do like to put a little bit of a twist on the beer, but even if it's a flavor that could be overpowering (like, say, chocolate orange), I try to go for at least modicum of subtlety (I don't want to drink a beer that tastes like candy - I'd rather drink a beer that tastes like beer and then go eat a bunch of candy. In fact, I think I'm gonna go do that right now). Anyway, I got way off track there. This recipe originated as a Christmas beer back in the day and now every year my family asks me if I've remade the chocolate orange beer, so I figured if it made that much of an impression I should probably bring it back.